After a gap of about six years, I recently installed Ubuntu in dual-boot with my current Windows 10. Must say, Ubuntu has tremendously improved over the past five years. After switching between Ubuntu and Windows 10 for a few times, I noticed that Windows 10 was not correctly displaying the time. Initially, I ignored the problem and manually corrected the time by turning off and then turning on the Set time automatically option on the Settings > Time & Language > Date & time page. But Windows 10 started displaying incorrect time each time after I switch from Ubuntu to Windows 10. If you have also installed a flavor of Linux in dual boot with Windows 10, you probably are also experiencing the same issue. Windows 10 displays the wrong time as it believes that the time is stored in local time whereas Linux OS thinks that the time is saved in UTC. Fixing this incorrect time on Windows 10 is easy. You just need to configure the Windows 10 to use the UTC. Here is how to do that. Step 1: Open the Registry Editor. 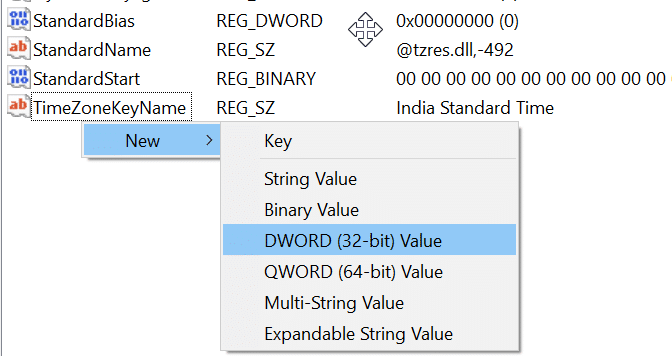 To do that, type Regedit.exe in the Start/taskbar search field and then hit the Enter key. TIP: You can copy and paste the above key in the address bar of the Registry Editor and press the Enter key to quickly navigate to the key. Step 3: Select the TimeZoneInformation key on the left side. 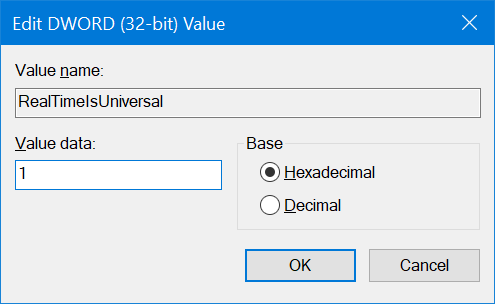 On the right-side, perform a right-click on an empty spot, click New, click DWORD (32-bit) Value, and then name it as RealTimeIsUniversal. 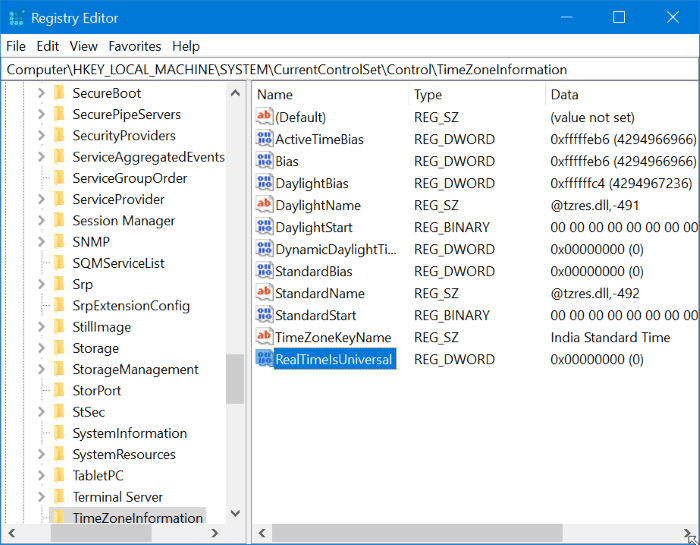 Step 4: Finally, double-click on RealTimeIsUniversal and set its value data to 1 to make Windows 10 use UTC instead of local time. To restore the original setting, simply delete the RealTimeIsUniversal value that you created. From now on, Windows 10 won’t display the wrong time when you switch between Windows 10 and Ubuntu. 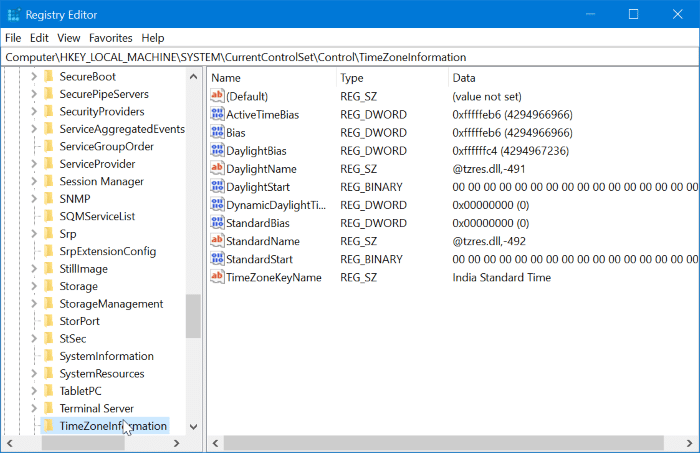 Our how to fix Windows 10 displaying wrong date and time guide might also interest you.